(Atlanta, Georgia) — The updated and revised fifth edition of the Guide Book of United States Paper Money will be available in late July, with its official debut at the American Numismatic Association World’s Fair of Money in Anaheim on August 9, 2016. The new book, a history and price guide on the paper currency of the United States, is by award-winning numismatists Arthur and Ira Friedberg. The 416-page guide is printed in full color with hundreds of high-resolution images. It retails for $24.95 and is available online (including at Whitman.com) and from booksellers and hobby retailers nationwide. The Guide Book of United States Paper Money describes in detail thousands of federally issued notes, including valuable rarities like the Demand Notes of 1861 as well as common currency found in our wallets today. The historical narrative explores topics such as the $2 bill; American money in the Civil War; the Bureau of Engraving and Printing; how cash is designed, printed, and distributed; how to collect, store, and care for U.S. paper money; grading standards for currency; and the many kinds of U.S. paper money printed from the 1860s to today. The authors cover recent developments in the hobby, including the latest Federal Reserve Notes. They discuss the Treasury Department’s upcoming redesign of the $20 bill using a portrait of abolitionist Harriet Tubman (as well as plans to include images of women on the $5 and $10 bills). 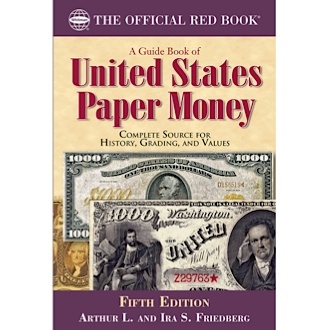 The first edition of the Guide Book of United States Paper Money was published in 2005, with updated editions released in 2007, 2010, and 2014. The Guide Book of United States Paper Money covers notes from $1 to $10,000 face value; Fractional Currency; Treasury notes of the War of 1812; encased postage stamps; error notes; signatures on U.S. currency; uncut sheets; and other hobby topics. The book includes a glossary and a bibliography for further research.